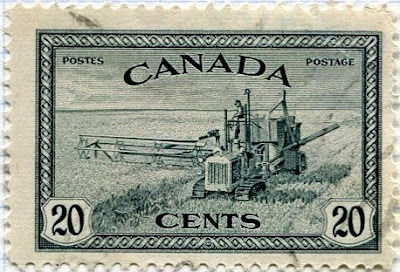 the Canadian prairies as a combined harvester reaping and threshing the wheat speeds up the harvesting process considerably. 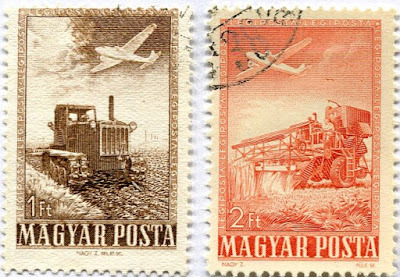 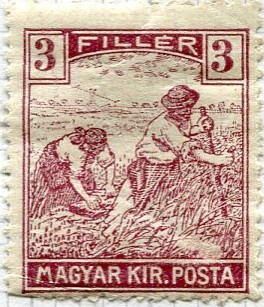 I like this Hungarian airmail set which combines fields, factories and transport (see here) so I'll thrown in a tractor as well as a combined harvester. 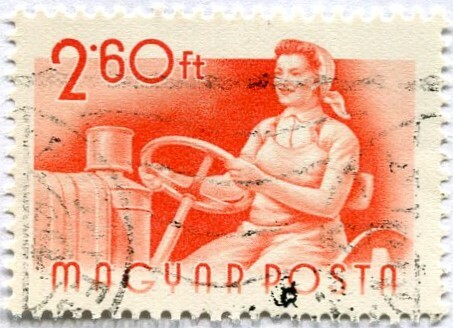 you cannot operate that sitting down. 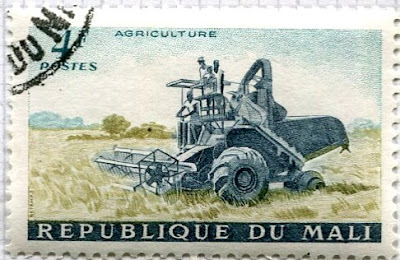 although it looks as though neither can you on this combined harvester working in a rice field. After all this work a refreshing cold beer might be on the menu perhaps made from hops from one of the world's major growers, Germany. 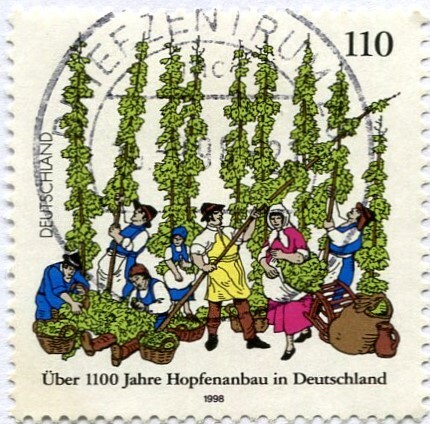 Here they are harvesting the hops, today of course there is a machine that does this but not as scenically as the workers on the stamp. 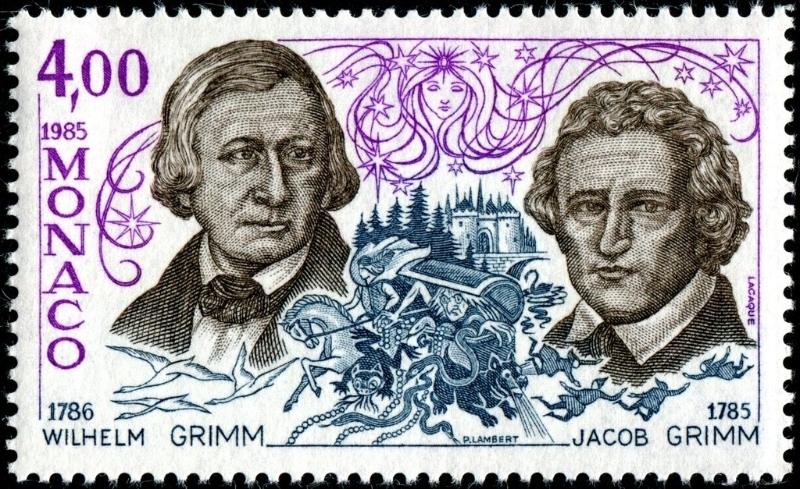 Germany has had a long history of issuing Humanitarian Relief stamps to support social welfare starting in 1929 however the series of stamps which were first issued in 1959 broke with their traditional subjects in an attempt to appeal to children and featured the tales of the Brothers Grimm. 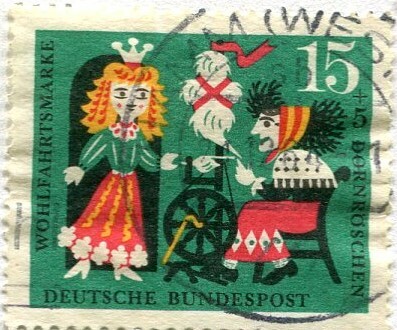 The series would be issued for nine years so I'm jumping in with two from the 1961 Hansel and Gretel set. We have the brother and sister with the cannibalistic witch luring them in to her gingerbread house and then Hansel trapped in the witches cage. The mother goat is warning her kids not to open the door while she is away however the wolf has tricked his way in with the ruse of a white floury hand, fooling them to think it was mother goat. 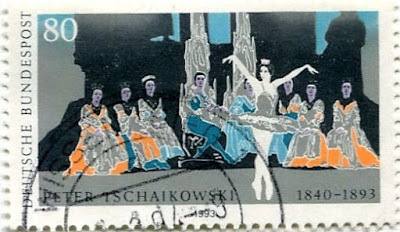 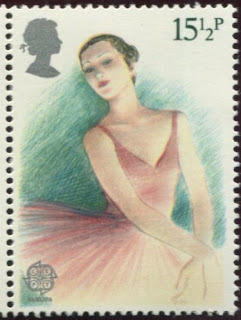 Down to just one stamp of this set and Sleeping Beauty about to prick her finger and go to sleep for a hundred years. 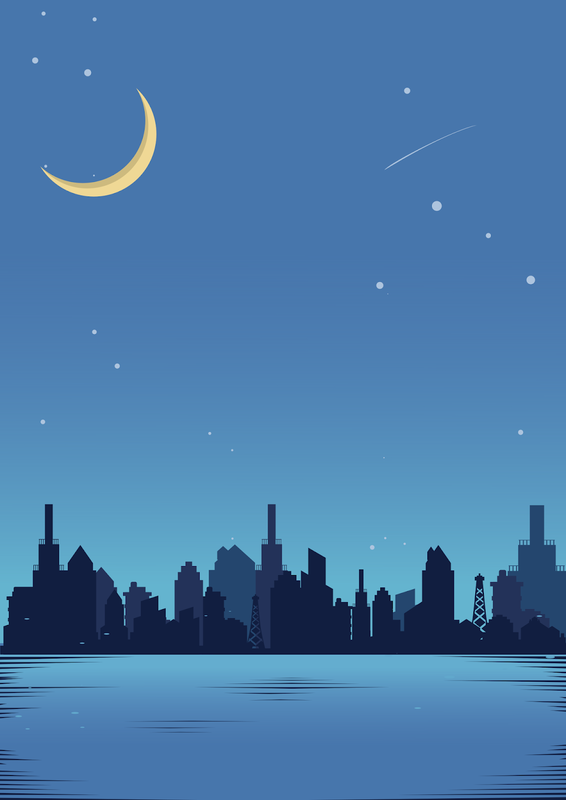 Lastly here is the Princess and the Frog meeting and dining until he is kissed and becomes the handsome prince. 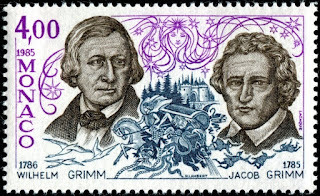 The Brothers Jacob and Wilhelm Grimm collected stories from the oral tradition that had been around for hundreds of years and wrote them down, publishing the first collection of 86 tales in 1812 but it had grown to 211 stories by the time of the 1857 edition. 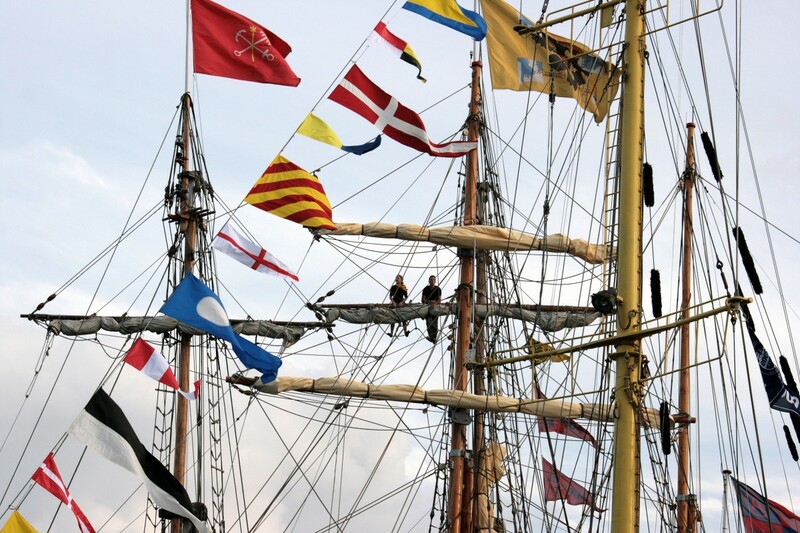 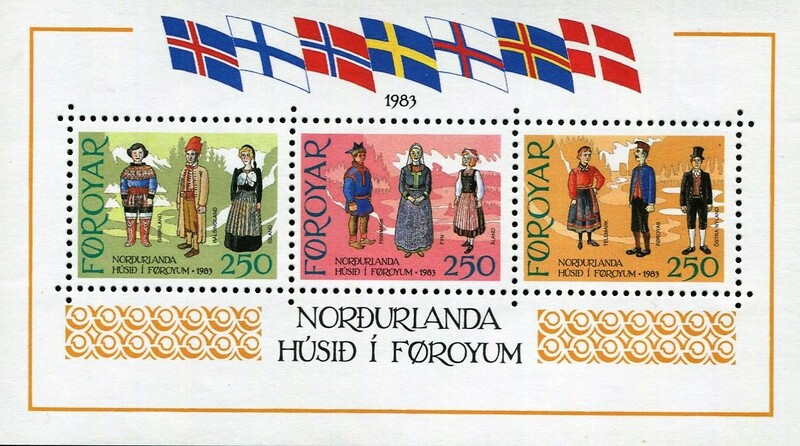 Nordic flags flying over national costumes. 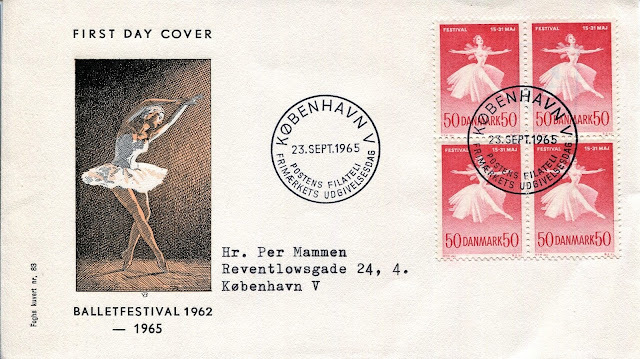 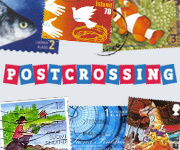 Thanks to the Wikipedia page showcasing the artist Bárður Jákupsson's stamps I can identify the costumes from left to right as - Greenland, Sweden, Iceland; Saami, Denmark, Aland; Norway, Faroe Islands and Finland. 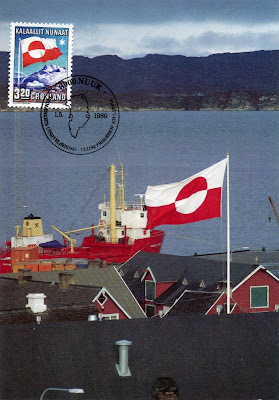 In the year the stamps were issued, 1983, the Nordic House initiative (promoting Nordic culture), opened in Tórshavn this fascinating building which used materials from all the Nordic countries in its construction can be seen here. 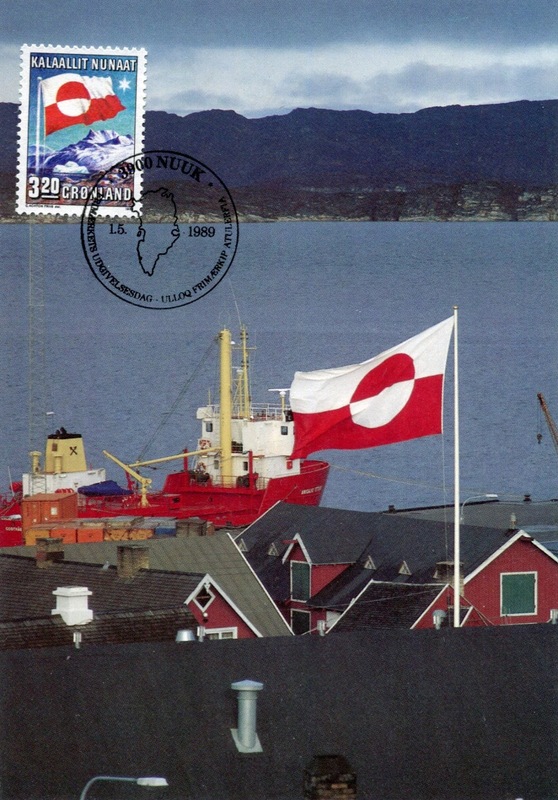 A grey day in Greenland but their flag certainly brightens up the roof tops and it is the only national flag of the Nordic countries without a Nordic cross but uses the same colour combination as the Danish flag which is often flown by its side. but I know that this would be the preferred means of communication for our little community. 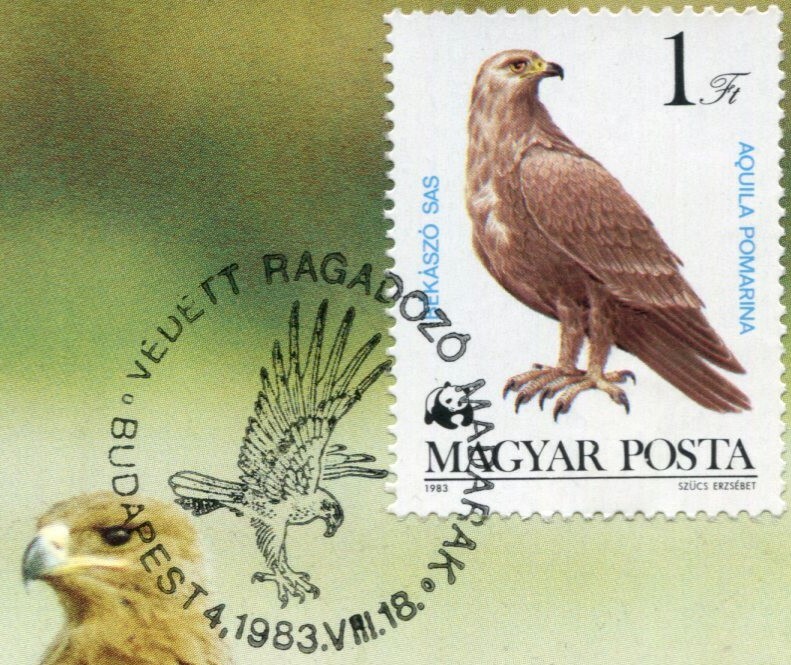 An Eastern Imperial Eagle with its large clear eyes and projecting brows gazes from its perch somewhere in Hungary. 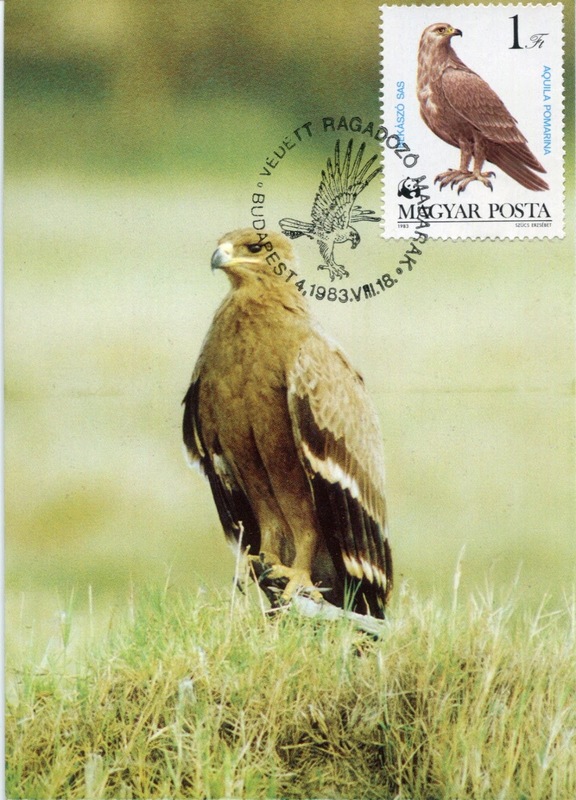 With a wingspan of 6-7ft (1.8-2.16m) it would be impossible to miss in the skies although it is a species on the red list and designated as 'vulnerable' so perhaps one would have to travel to the North Hungarian Mountains and, only if lucky, see it soar among the peaks. 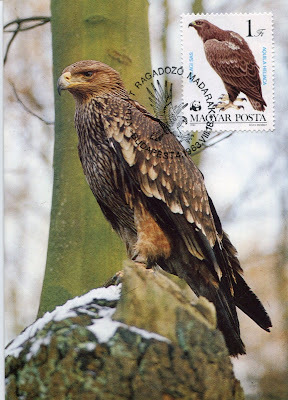 The Lesser Spotted Eagle is an unusual bird of prey in that it hunts its diet of frogs, mice and insects on foot and can be seen prowling in lightly wooded areas. 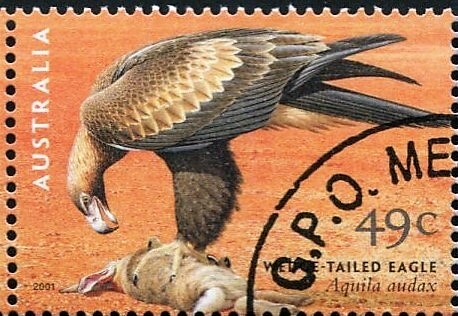 The wedge taled eagle is Australia's largest bird of prey and one of the largest eagles in the world with a wing span of 6ft - 7ft 7in and is reported to be able to fly tirelessly for hours on end soaring high in the skies of Australia, Tasmania and Papua New Guinea at altitudes of 2000 metres and has even been recorded as high as 6,800 metres above the ground. 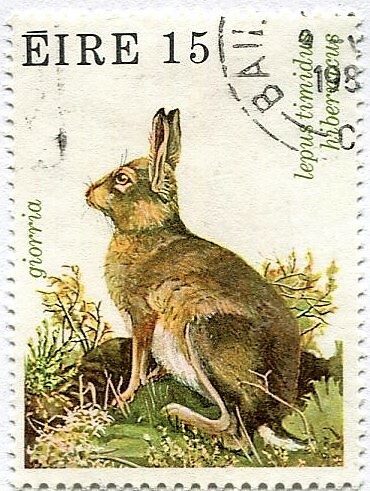 On the stamp it has decidedly got its feet on the ground or rather a fluffy bunny, its common meal of choice. 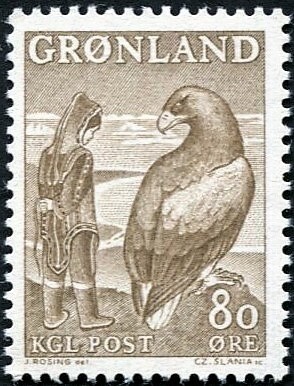 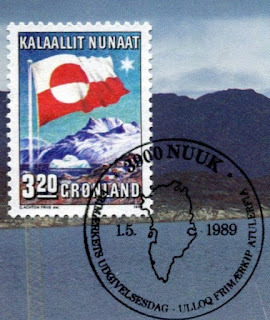 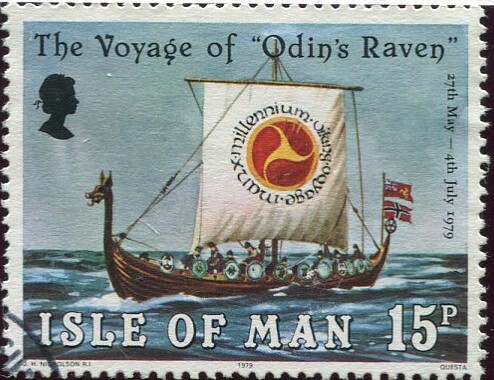 Eagles have featured in the legends of many cultures and this stamp features a Greenland legend called 'The Girl and the Eagle'. The blog 'Slania Crazy' was unable to find any telling of the story and I have drawn a blank also so all I can do is gaze at the stamp, see the rope in her hand, the stern gaze of the eagle and the vista from a high peak. 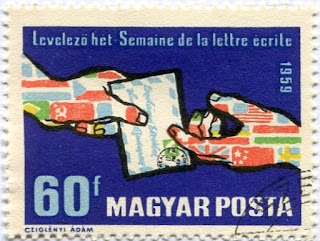 The stamp was the 5th in an occasional one stamp issue on the theme of Greenland Legends issued from 1957-1969.
go off piste and watch one about to swoop on a bobsleigh team. 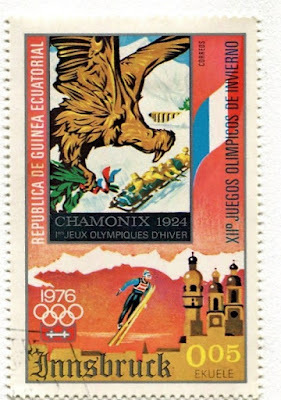 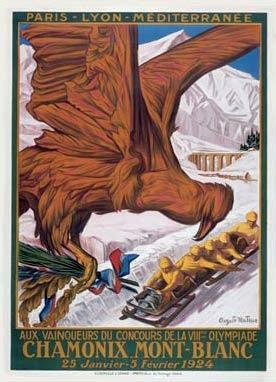 The poster featured on the stamp is from the first ever Winter Olympics in Chamonix, 1924 and serendipitously this stamp gives me three Es all in one. 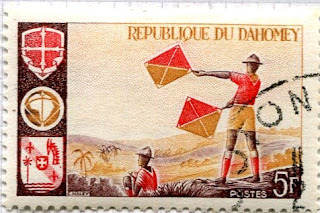 The Dodo Carnival is a tradition of wearing animal masks and dancing though the villages of Burkina Faso which sounds like a fun day out. The Dodo legend originated in Nigeria and was introduced into Burkina Faso by traders. 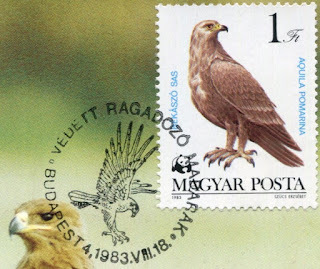 The story goes that a man during the Friday of Ramadan went hunting, which is forbidden, and killed an animal. 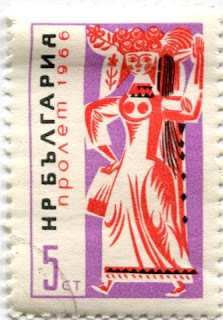 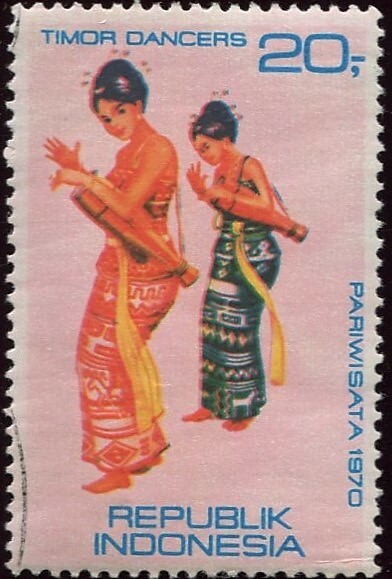 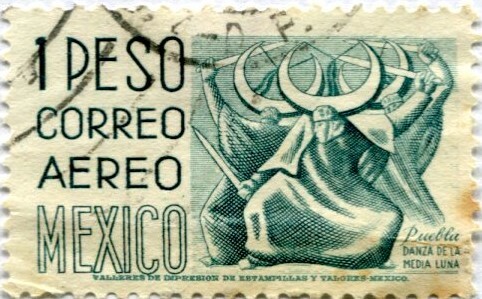 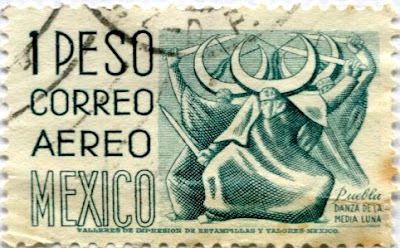 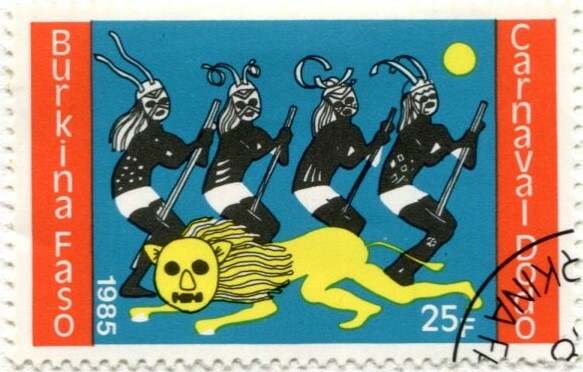 He was punished by being transformed into a man with an animal head but his village did not shun him but tried to gain mercy from the gods by dance and there it is on the stamp. 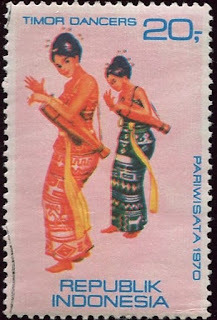 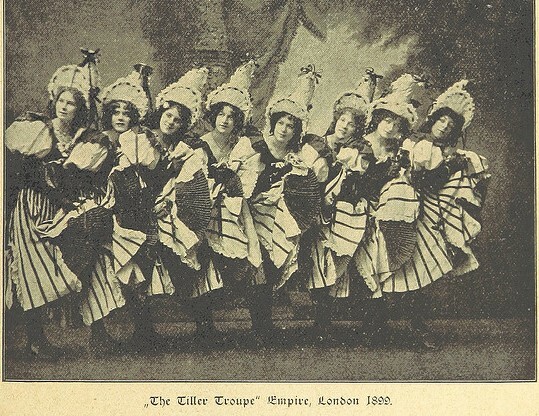 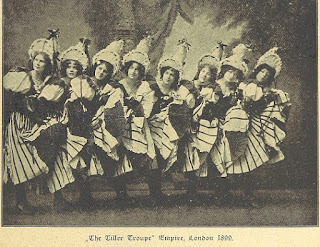 For something prettier turn to Timor dancers who can make their own music. Is this a comment on women's roles in the 1950s? 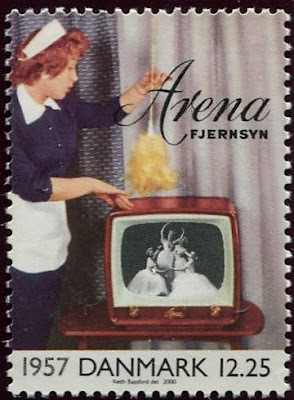 The theme is communications and Arena was a Danish producer of radio and television sets started by Ove Heath Nielsen in the corner of his father's bicycle factory but grew to become the largest supplier of televisions in Denmark in the late 1950s. 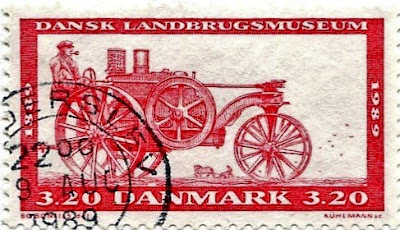 Today its place is in the Industrial Museum in Horsens where the factory was located. 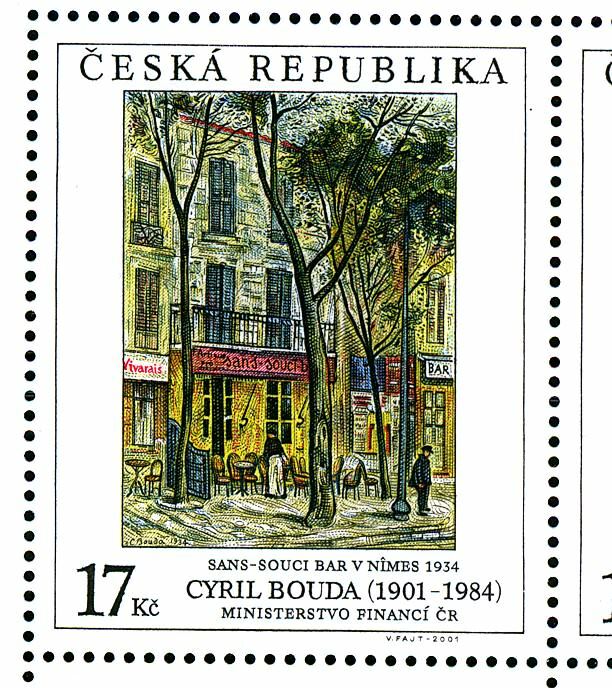 and who would not want to sit outside the Sans-Souci Bar in Nimes and enjoy a coffee or something stronger. If one wanted to combine the pleasure of city within reach of sandy beaches and a harbour front then travel to Setúbal on the Sado River Estuary and perhaps watch a pod of dolphins play nearby. 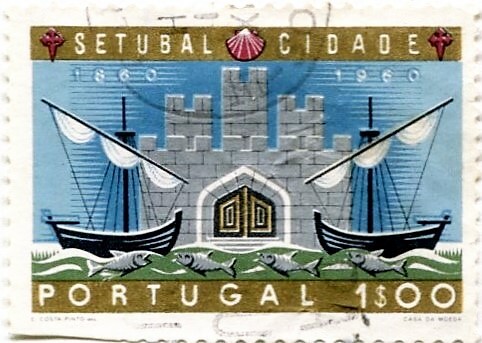 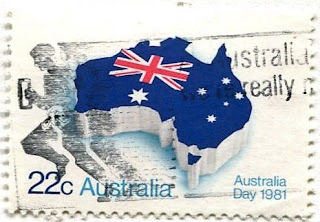 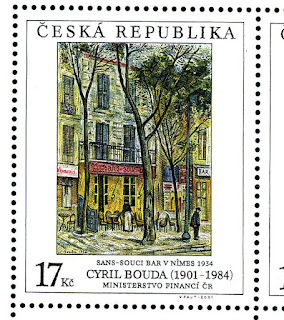 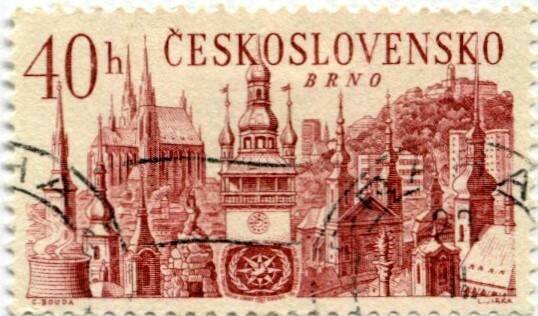 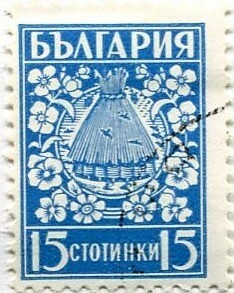 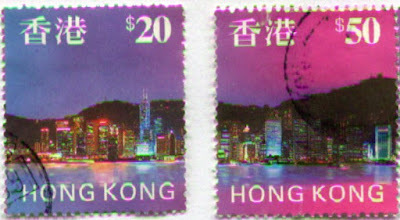 The stamp features the city's coat of arms. 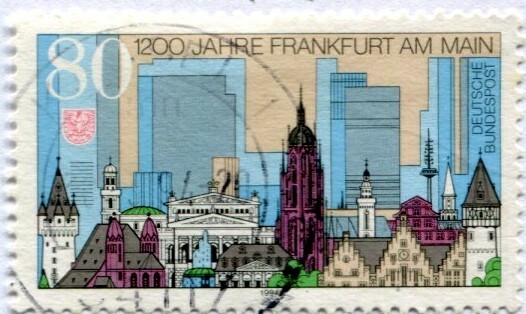 Here the designer gets to combine old and new with both towers and skyscrapers in Frankfurt. The beautiful facades of Görlitz town houses in Altstadt make an appearance on this German stamp. 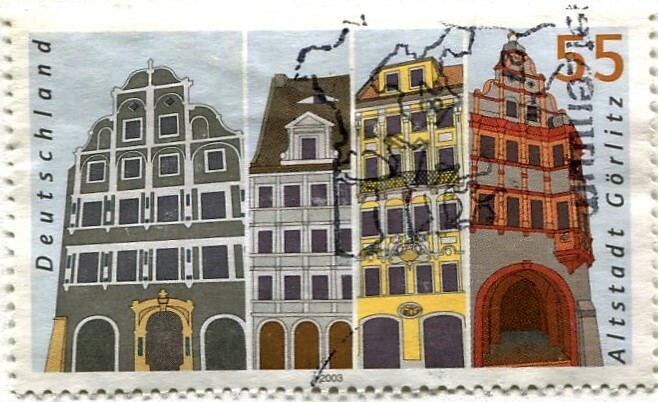 In 1945 Görlitz had survived the destruction of the war but the redrawing of boundaries divided the city resulting in the left bank of the river being in Germany and the right bank in Poland so one can combine two countries united within the European Union in one visit. The city has provided many film directors with locations including Wes Anderson's visual delight The Grand Budapest Hotel. 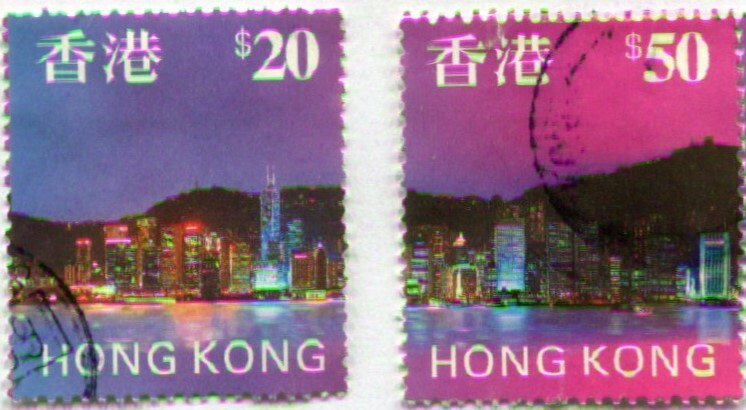 The lights are coming on so it is time to go out on the town. 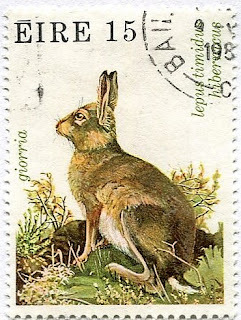 Spring is in the air, daffodils are in flower and as we have just had the warmest February on record here so no wonder I heard a buzzing among my flowering heart ivy (sometimes called Paddy's Pride). 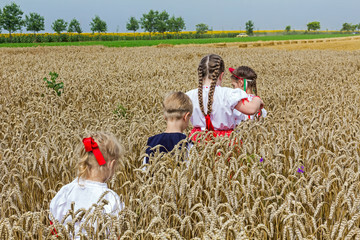 of flowers and clover rich meadows. 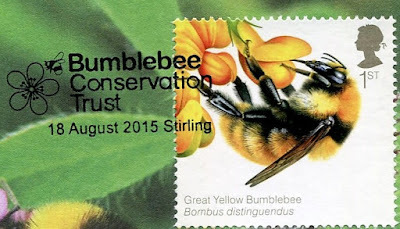 The great yellow bumblebee shown here flies over grasslands looking for clover, vetch and knapweed. 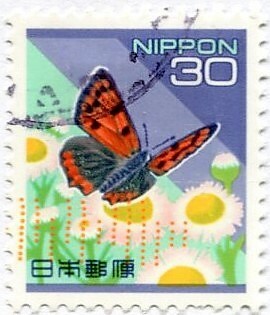 maybe it will be joined by a copper butterfly which can be seen in all sorts of habitats but daises are never in short supply. 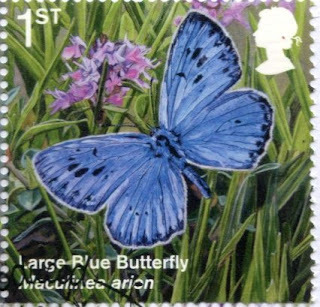 The Large-Blue is a specialist which is probably why it became extinct in England in 1979 for its grubs feed on a single species of red ant. 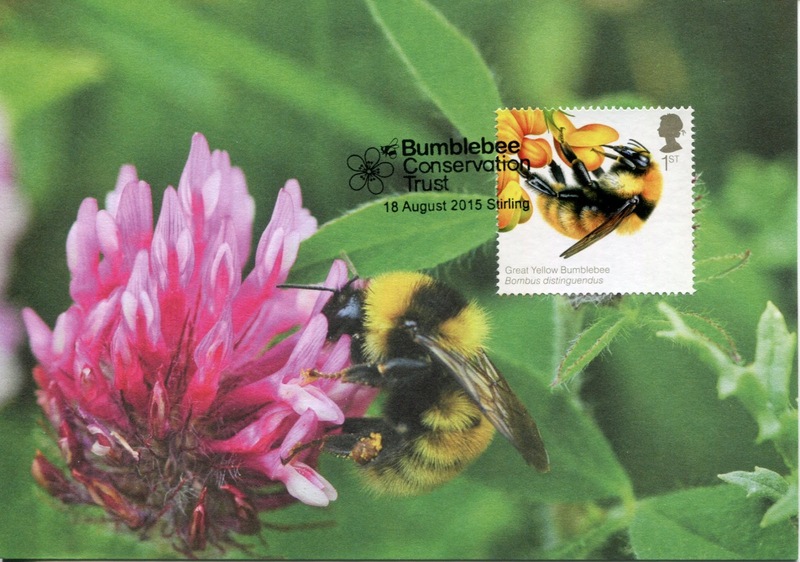 Fast forward to 2006 and 10,000 eggs were painstakingly placed by conservation projects in SW England. Ten years later and 250,000 eggs were laid on wild margoram and thyme plants at reserves in Gloucestershire and Somerset. 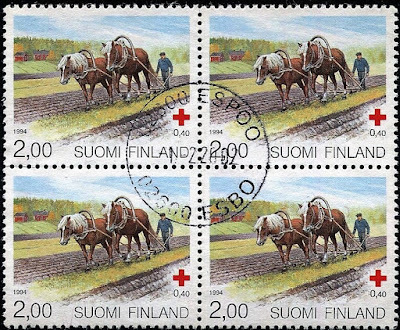 I wonder who counted them? 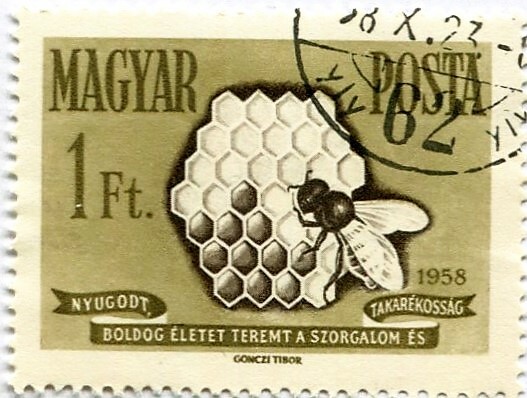 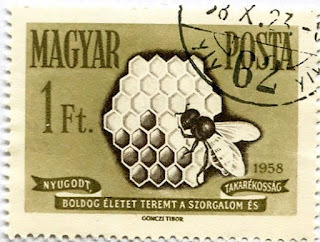 Sunday Stamps II prompt this week is the Letter B - here for Bulgaria, bees, beehive and butterflies - See It On A Postcard. Baby boomer living on a coastal peninsula in North West England.